See Voalte customers speak at HIMSS18. We're looking forward to having James Jones of UW Medicine's Valley Medical Center and Candice Friestad of Avera Health share their experiences to drive improvements at healthcare organizations throughout the country. Voalte, the leader in healthcare communication technology, today announced that two customers will present educational sessions at the 2018 HIMSS Conference and Exhibition, March 5 to 9 in Las Vegas. In addition, Voalte will participate in a Physician Communication Meetup featuring healthcare industry influencers. Tuesday, March 6, 11-11:45 a.m.
Wednesday, March 7, 5-6 p.m.
"Voalte customers are leaders in the healthcare communication industry," said Trey Lauderdale, Founder and CEO of Voalte. "They have developed unique technology integrations and seamless clinical workflows that push the envelope of clinical communication to positively impact patient care while controlling costs. We're looking forward to having James Jones of UW Medicine's Valley Medical Center and Candice Friestad of Avera Health share their experiences to drive improvements at healthcare organizations throughout the country." 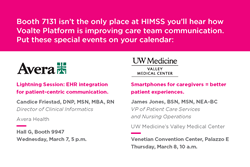 Schedule a demo of Voalte Platform, our comprehensive clinical communication platform, at Booth 7131 at HIMSS18, and hear how our new partnership with Lightning Bolt Solutions brings together physician scheduling and care team communication. 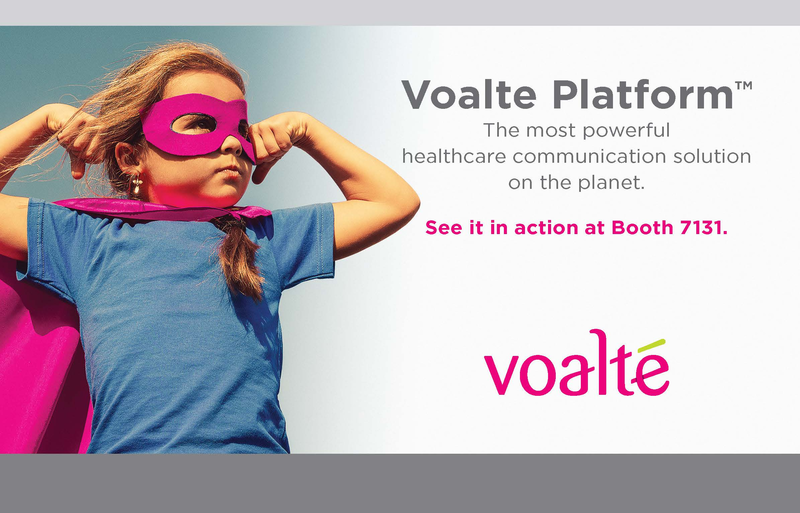 See Voalte Platform in action at booth 7131.